First of all, I have to apologize that the images were not as satisfactory as I wanted it to be as it was captured at night after I prepared the Kuih. I made the wrong decision of preparing it at evening.. As the kuih cannot be kept for long (preferably not overnight), I have decided to have my photo shooting session at night. 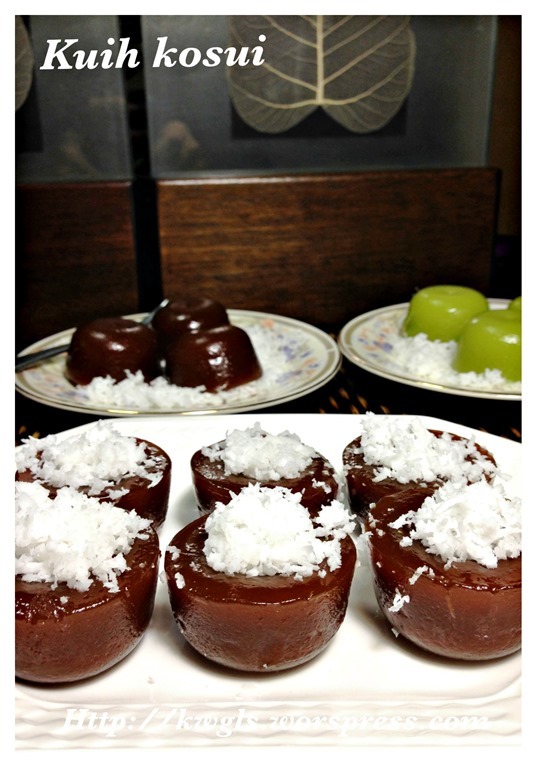 Kuih Kosui or ko swee or 卡穗糕 or kuih Kaswi is a type of nonya cakes steamed in small Chinese tea cups. It was usually served with freshly grated coconuts. 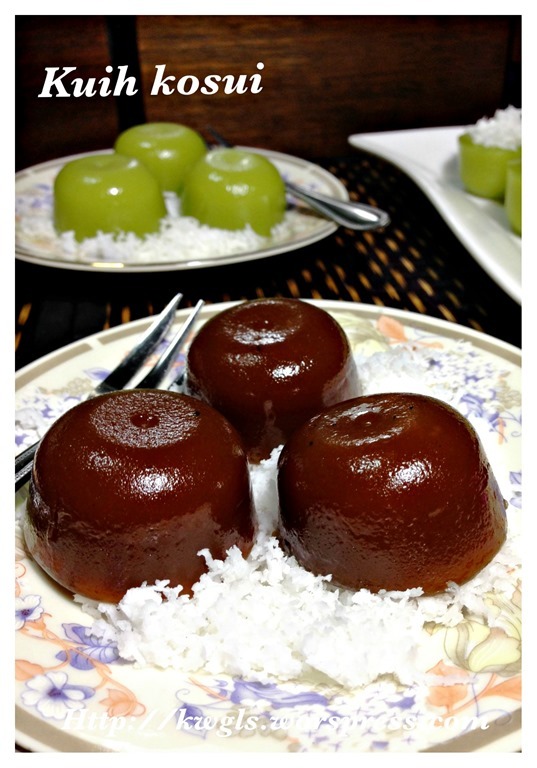 It is supposing to have a springy texture and sweetened by the aromatic coconut sugar. 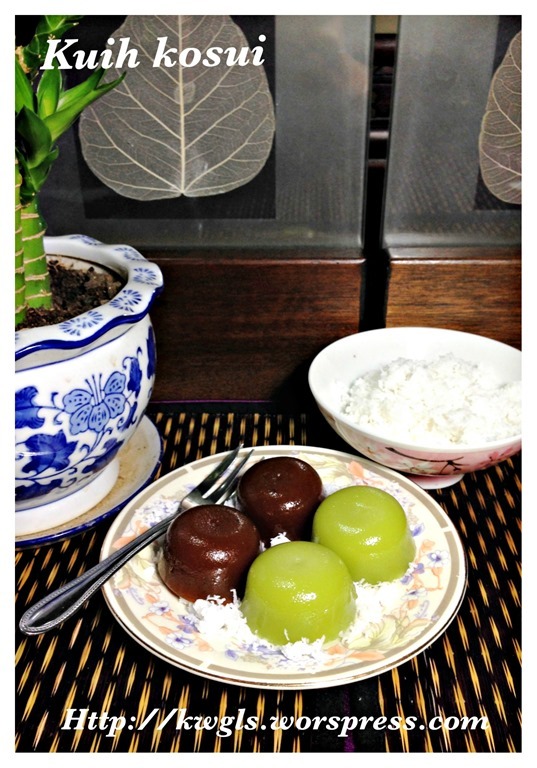 However, in recent years, pandan flavour have developed have I have decided to share both variations in the same post. As compared to our Malay brothers, most nonya recipes uses alkaline water, rice and tapioca flour where as Malay recipes uses kapur (edible calcium carbonate or chalk), rice and wheat flour. Lightly greased 20 Chinese small teacups suitable for steaming. Heat the gula melaka or gula apong, white sugar and water in a microwave for about 1 minutes (until the sugar dissolved). Add the rice flour, tapioca flour and alkaline water, stir until well mix. Return the solution back to the microwave, heat for another 1-2 minutes. In the interval of 0.5 minute, take out the bowl and stir. 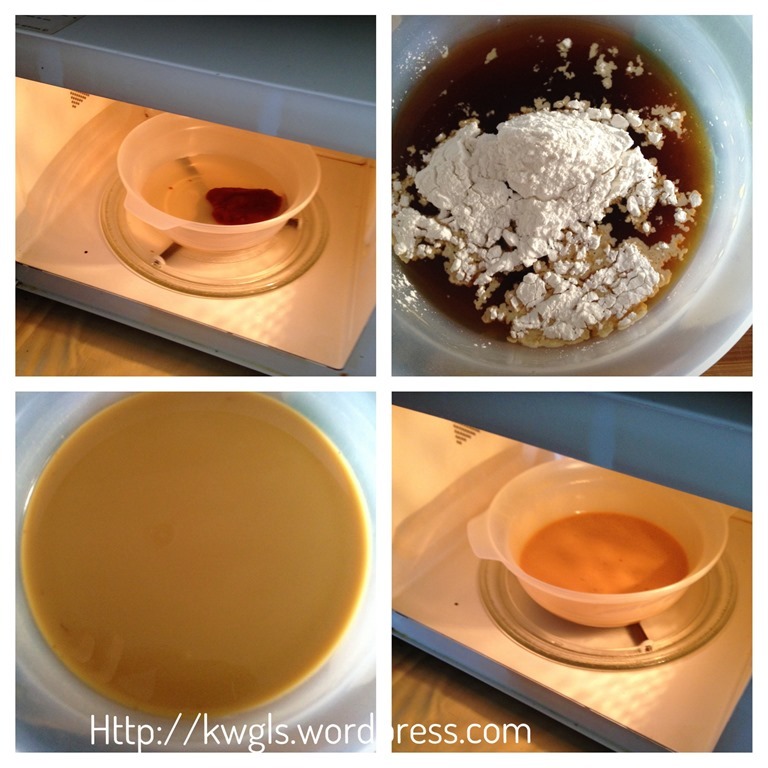 As long as the solutions starts to thicken, you can take out from the microwave and transfer to the greased cups. Note that depending on individual microwave oven, it can be rather fast. Keep an eye and as long as it is thicken (but can still be poured, it is consider done). If you do not have a microwave oven, perform the same procedures over the stove. Note that you must use medium to low heat to heat the sugar and rice flour solution. Constant stirring is required until it thickens. 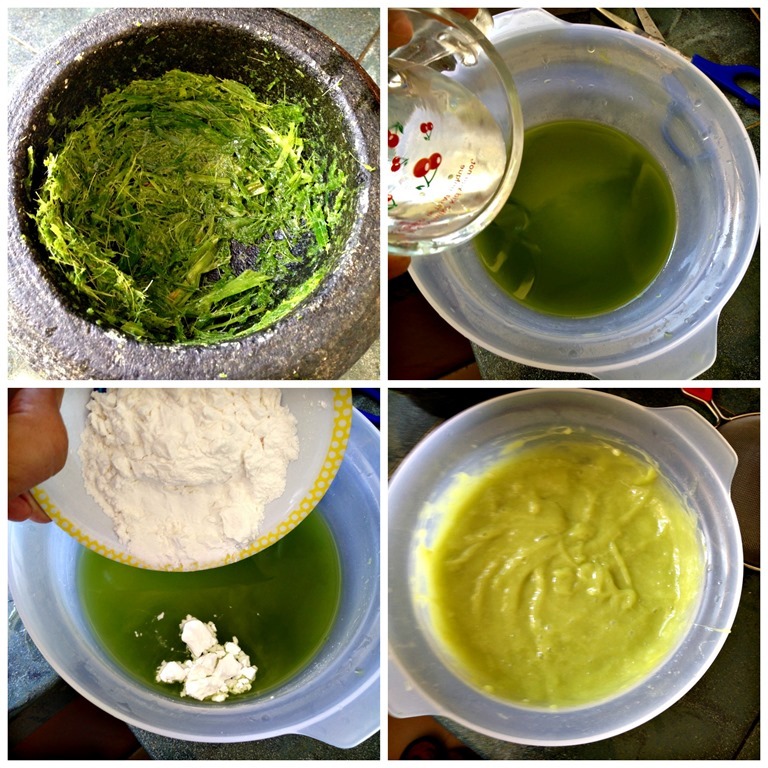 For the Pandan Kosui, extract the pandan juice using the lukewarm water. Once the juice is extracted, add all remaining water (if any), white sugar, rice flour, tapioca flour and alkaline water. Stir until well mix. Put the pandan flavoured rice solution in the microwave and heat for 1-2 minutes until it thickens but can still be poured. If you do not have a microwave oven, perform the same over the stove using medium to low heat and constant stirring is required until it thickens. Once the partially cooked rice solution is ready, transfer it to the greased cups. Steam in a steamer for about 10 –15 minutes under medium to high heat. It is consider as cooked when colour changes and a tooth pick inserted comes out clean. 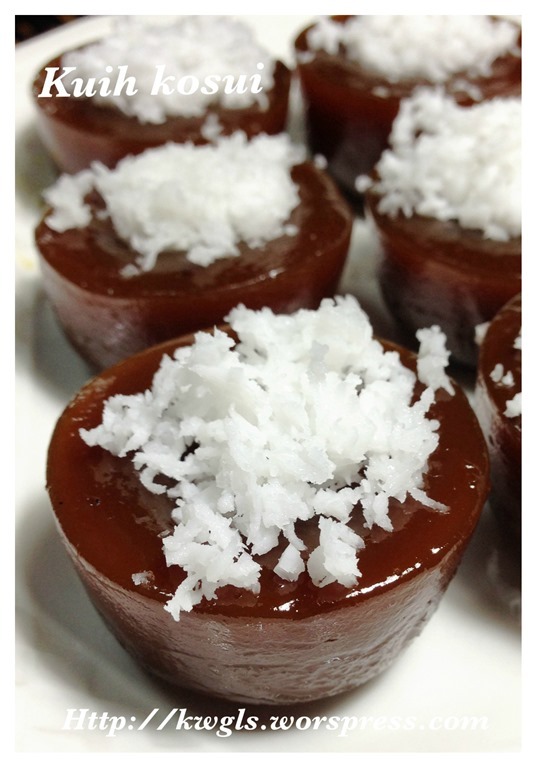 Leave it to cool completely and use a toothpick to unmould the steamed cake. 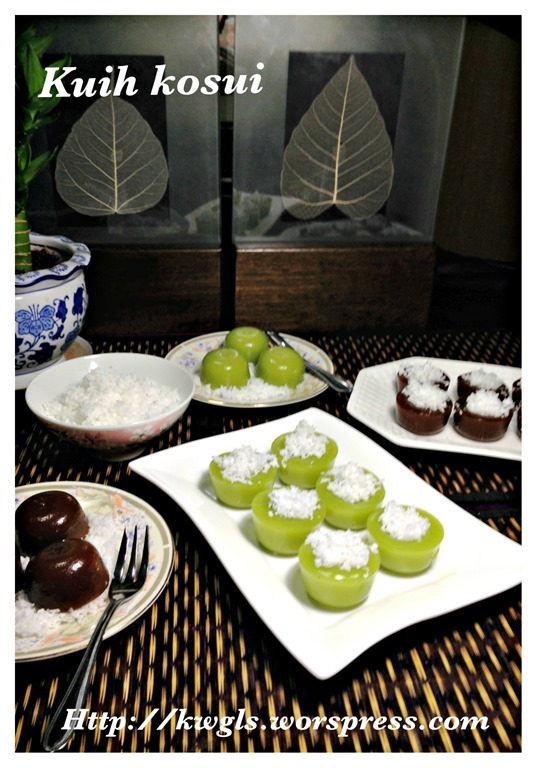 For the grated coconut, steamed the grated coconut in a steamer,pinches of salt and the pandan leaves. Steam in the steamer for about 10-15 minutes or until the pandan leaves are soft. 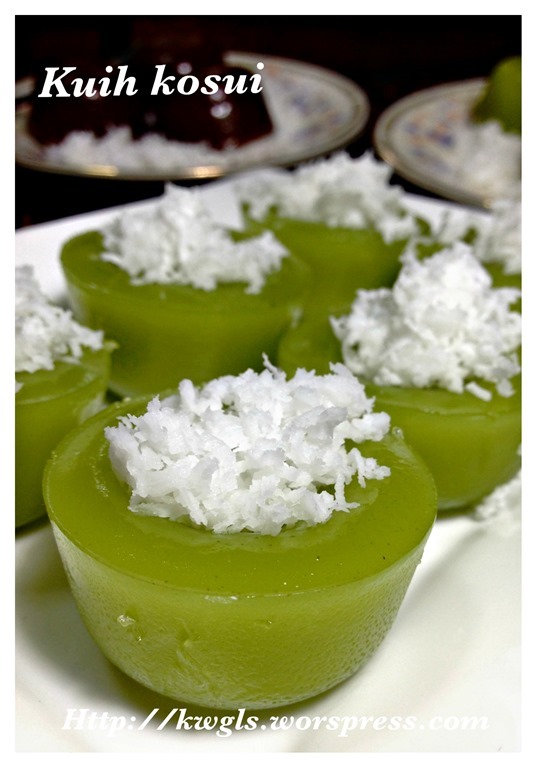 For servings, scoop some grated coconut and put on top of the kuih kosui. Best served as a snack item. 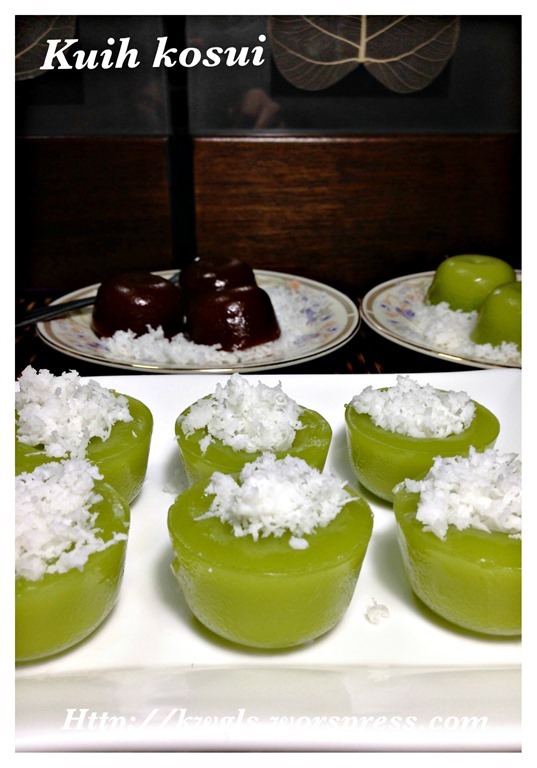 Happy to add another Nonya kuih to my recipe list. I would say this is not difficult to prepare but taste is very nice. Do give it a try and see if it suits your taste buds. Hope you like the post today. Cheers and have nice day. 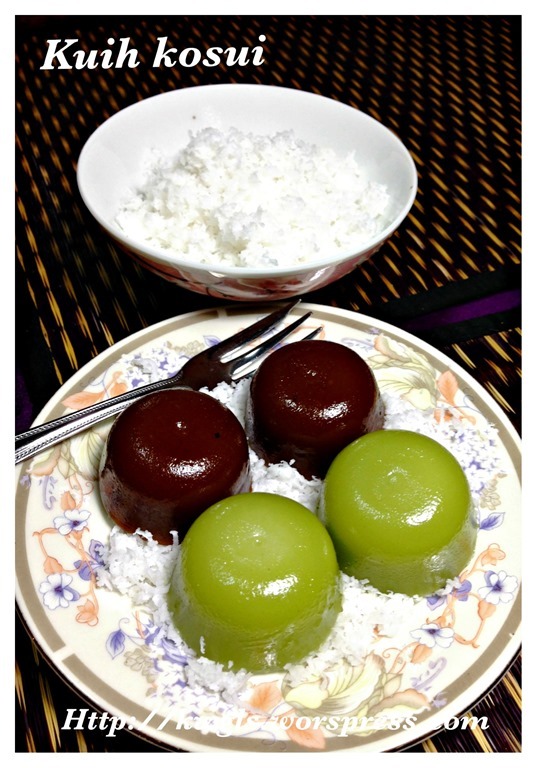 This entry was posted in Chinese and Asian Cakes and Snacks, Desserts, Food Preparation Series and tagged 8, GUAI SHU SHU, Guaishushu, kenneth goh, kueh kosui, kuih Kaswi, kuih ko swee, kuih kosui, nonya kuih kosui, postaday, 卡穗糕. Bookmark the permalink. 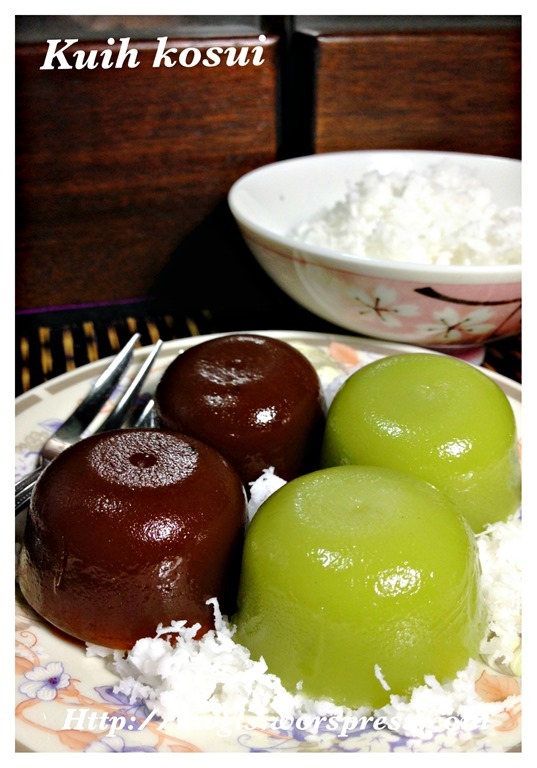 Many delicious food n kuih that we can learn from ! Great ! cos sunday going pai pai in the morning ..
Hi hi. I m trying out your recipe but have some issues. Appreciate your advice. Is tapioca flour = tapioca starch? For the grated coconut, can I use desiccated coconut ? Is it the same? Y must steam d grated coconut? Hi may I know where did u buy those little cups? 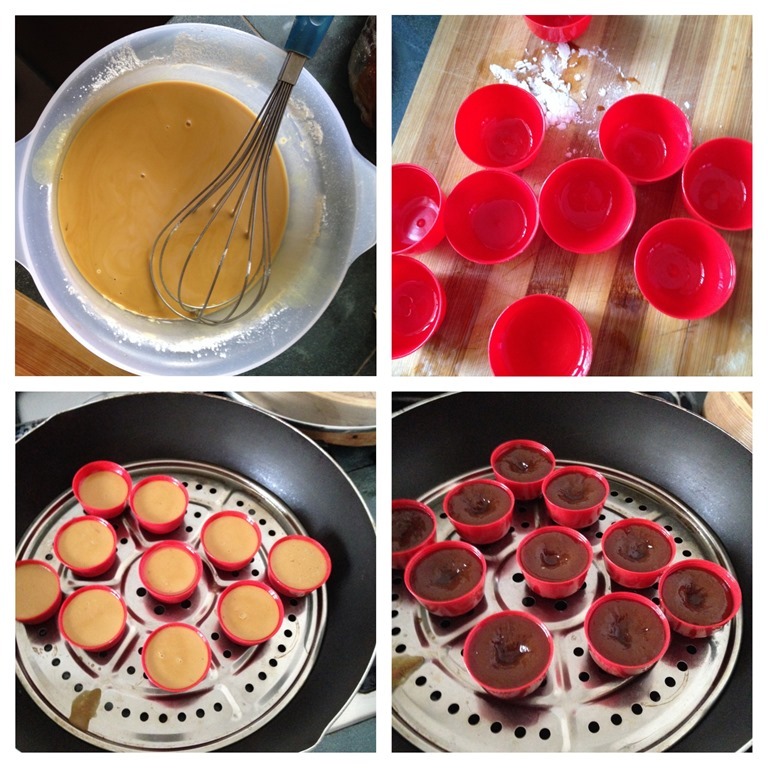 hi kenneth, im so desperate to make this b cos i bought some kosui making cups and of cos kosui also is one of my fav kueh 🙂 but the problem is i don’t have kan sui to make kosui…heheh sounds funny right, what do u think if i insist to try without using kan sui/alkaline water, b cos i really really cannot find here at the supermarket. what do u think the kosui texture will like, with ur expert opinion or point of view? oh…i see, so means i can try without alkaline too….ok..ok, is good idea, maybe i can try 10 cups, so means, i cut down ur recipe into half.? anway, thanks Kenneth for quick respond, ur answer mean so much to confidence and decision making …. hehe..
Hi kenneth, just letting u know that i managed to make this just now! 🙂 and guess what? surprisingly i found kapur sirih water at the meat section..lol.. thanks god for that. The kosui was so yummy, i can’t stop eating!! thank you for sharing your recipe kenneth..it was a great experience and im glad i make this with ur recipe just enough for small family. what a good try! i can make anytime i want now. thanks again. Can I substitute tapioca flour with either sweet potato flour or potato starch? Thank you. Managed to get tapioca flour. Attempted the recipe but even after steaming the mixture didn’t form up. Cooked until sticky but still can scoop out but after steaming it became watery. What could have gone wrong? I bought air abu soda, issit the same as alkaline water? Hi can I know exactly what are those red cups called? And where do I buy it? Kuih Kosui is one of my favourite. Thank you very much for sharing your receipi. I will try it out but would like to check with you if cutting down the sugar to 50gram…will it be okay? 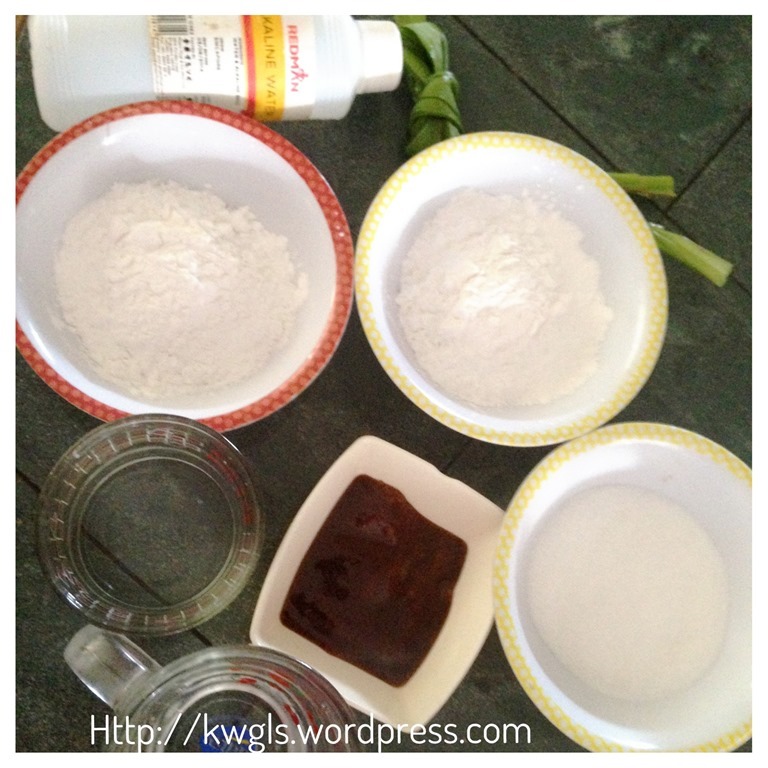 Will it effect the texture of the Kuih in anyway? 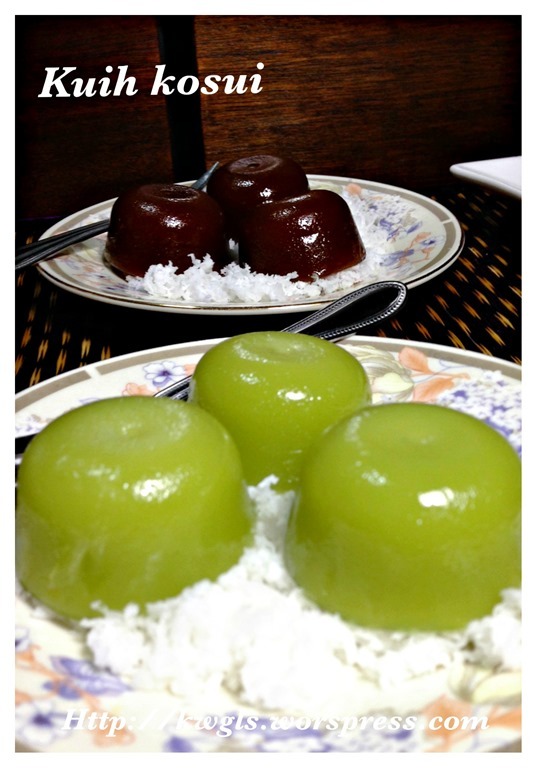 I do not believe it will affect the texture of the kuih..
Hi kenneth, kuih kosui is my favourite nyonya kuih thanks for sharing, may I hv kuih kosui resepi in chinese version?